Contact: Steve Anderson, Head Winemaker, Eola Hills Wine Cellars. RICKREALL, OR —On the heels of its 30th anniversary (celebrated in November 2016), Eola Hills Wine Cellars – one of Oregon’s oldest, locally-owned wineries – is proud to unveil a number of new releases and specialty wines this year, including a commemorative Pinot Noir celebrating the 2017 Great American Eclipse set to sweep across Oregon in August; two sparkling wines made in the traditional champenoise method; a 1996 and 1997 Colheita LBV Port Wine; Barrel Select Reserve Pinot Noir and the first Tempranillo every produced by Eola Hills Wine Cellars. In honor of the total solar eclipse set to sweep across Oregon on August 21 – and the special viewing party and festivities hosted by Eola Hills Wine Cellars – the winery has released a special wine to commemorate this rare celestial event. Total Eclipse Pinot Noir is 100% hand-crafted Oregon Pinot Noir and boasts cherry, strawberry and blackberry notes. This bright, fresh sparkling wine was crafted using traditional method champenoise using 100% estate-grown Chardonnay from Eola Hills’ Wolf Hill Vineyard located in the Eola-Amity Hills AVA of the Willamette Valley. 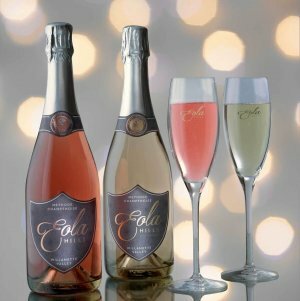 This beautiful sparkling wine is made from 100% Pinot Noir grapes from Eola Hills’ newest vineyard property, Legacy Estate Vineyard, located in the Eola-Amity Hills AVA of the Willamette Valley. Bright and crisp, with hints of red fruit perfectly describe this sparkling which can make any occasion truly a special occasion. Made from Cabernet Sauvignon fruit from Eola Hills’ founding property, Oak Grove Vineyards, this 20-year old wine matured in oak barrels from October 1996 until mid-June 2016. “At 20 percent alcohol and 8 percent residual sugar, I would describe this wine as a dry port,” says Eola Hills Head Winemaker Steve Anderson. “While still somewhat sweet, over the decades, the acid has become concentrated and now offers a strong counterpoint to the sweetness, while enhancing the flavors of brown sugar, milk chocolate and dried figs,” adds Anderson. The 2015 Tempranillo is sourced from the Umpqua Valley area and is the first Tempranillo ever produced from Eola Hills Wine Cellars. Loaded with ripe, red fruit it features notes of hibiscus, pomegranate and black tea. Additional new releases and specialty wines include a 2014 Reserve Oregon Pinot Noir, Wolf Hill, with grapes sourced from one block of Eola Hills’ estate vineyard, Wolf Hill; a 2014 Reserve Pinot Noir Barrel Select, produced from select barrels from Eola’s best vineyard lots; the 2014 Reserve Fossil Block Pinot Noir, produced from grapes from the fossil-rich slopes of the Eola Hills; a 2015 Reserve Zinfandel, crafted from grapes grown on the century-old vines of the Mohr-Fry Ranch in Lodi, California; and an Oregon Rosé, made with a unique blend of Muller-Thurgau, Muscat and Marechal Foch. All wines are available for purchase at the Eola Hills tasting room in Rickreall or online at www.eolahillswinery.com. Wine club members receive a 20% discount on all wine purchases. To learn more, call (503) 623-2405 or visit www.eolahillswinery.com. In 1982, Oregonian Tom Huggins and 11 investors established their first vineyard, and in 1986, Eola Hills Wine Cellars produced its first wines. Today, founder Tom Huggins serves as General Manager and CEO. Head winemaker Steve Anderson has been with Eola Hills for more than 20 years. Eola Hills Wine Cellars strives to produce excellent wines at fair prices – wines that capture the spirit and flavors of Oregon. Eola Hills Wine Cellars vineyards are located in the Eola-Amity Hills American Viticultural Area (AVA), in Oregon’s mid-Willamette Valley, between Salem and the Coast Range. The winery and main tasting room are located in Rickreall; two additional tasting rooms can be found at Legacy Estate Vineyard in Salem, and in historic, downtown McMinnville. For more information, go to www.eolahillswinery.com.